Udaigiri or the sunrise hill in Odisha is the state�s largest Buddhist complex. The destination is renowned for its better preserved large stupa, ruins of brick stupas, monastic ruins, and other objects of Buddhist antiquity including rock cuts and sculptures. 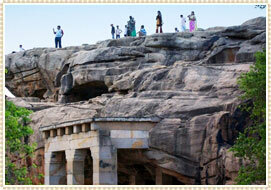 The site in the late ancient period was a flourishing site of learning as a part of Pushpagiri University. A part of Udaigiri is still under excavation, which is believed to unearth better preserved sculptures. 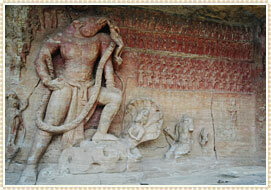 Located 20 km northeast of Cuttack, Udaigiri is 100 km from Bhubaneswar, the capital of Odisha. Archaeological excavations : The first archaeological excavation in Udaigiri was initiated in the year 1959 and since then numerous excavations have been conducted to unearth the Buddhist gems from the site. These include a huge brick monastery, housing many ancient Buddhist sculptures. It is believed that once the excavations are complete, Udaigiri Tour will be one of the most visited attractions of Buddhist world. The site is full of inscriptions and rock cut sculptures which currently attract lots of tourists to the Buddhist Golden Triangle including Ratnagiri and Khandagiri. All these make the visit to Udaigiri an interesting tour option for both the archaeologists and pilgrims. Udayagiri Cave 1, also known as Rani Gumpha houses some beautiful sculptures of elephants, monkeys, sword fights and abduction of women, all of which are connected to King Kharavela. Though not very important, the sculptures represent rich artistic expressions and offer a good experience to the history lovers. The city is in the 20 km to the Northeast of Cuttack and is 100 km from Bhubaneswar. Ratnagiri: Ratnagiri near Udaigiri tour is an important destination for the Buddhist pilgrims and archaeology enthusiasts. The site is renowned to have connections with Lord Buddha and some of his disciples. Famous for its monastery of 6th-12th century period, Ratnagiri boasts a rich collection of Buddhist heritage in the region. Cuttack: Formerly the capital of Odisha, Cuttack is a commercial city driving in the business opportunity of the state. The city�s tourist attractions include 13th century Barabati Fort and silver filigree jewellery shops in Balu Bazaar and Nayasarak. Kendrapara: Famous for Baldev Jeu temple, Kendrapara is city is also known as Tulsi Kshetra. A car festival or �rath-yatra� held during June / July is the highlight of Kendrapara. Air : Bhubaneswar, the capital of Orissa, is the nearest Airport. Train : Ratnagiri is nearest railhead to Udaigiri. Road : well connected to the cities such as Bhubaneswar etc through the road network. However, private taxis are more favourable than the buses.